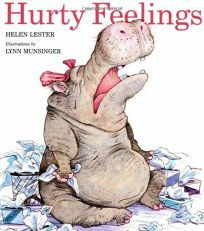 The team behind Hooway for Wodney Wat introduce another memorable character's struggles in Hurty Feelings by Helen Lester, illus. by Lynn Munsinger. The not-so-ironically-named Fragility may be one tough hippo, but she can't take a compliment. When told she has sturdy legs, she cries, ""You hurt my feeeeelings!... A piano has sturdy legs. So you think I have piano legs."" Her dramatics cause her friends to snub her, until an encounter with a bullying elephant helps her realize her overreactions. .